Clothes. Who needs em? Totally kidding!! Contrary to what you may have seen on shows like “Naked and Afraid,” clothes are not optional. 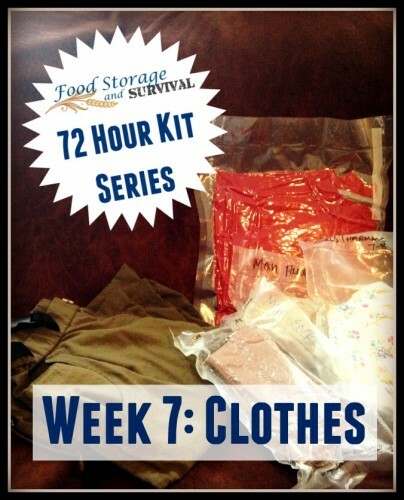 This week in our 72 hour emergency kit series we’re covering the topic of clothes. As I have in the past, I’m going to cover different options and ideas for you to consider, then it’s up to you to make the best choice for your personal situation. You might think this would be a simple topic, but there are lots of options and it all really depends on what your plans are. Answering the following questions will help you figure out what types of clothing you’ll need to pack in your emergency kit. 1. Are you staying or going? If you’re staying in your home, you’re set as long as you’ve done laundry recently! If you’re going, read on! 2. If you’re evacuating, where are you going? Grandma’s house? A hotel or shelter? Out to the woods? Dressing for a night at grandma’s or a night alone in the woods are probably not the same. 3. Do you want to blend in or stand out? If your plan is to hide in the woods, you’ll want to blend in to the woods. If your plan is to evacuate through a city, you’ll want to blend in with the other people walking the street. If you’re going to a shelter and you want to be able to quickly count all the kids to make sure they haven’t wandered too far, consider matching shirts for each family member of a bright color. I’ve seen this suggested, but I would NOT go so far as putting names in a visible location on your shirts. You don’t want some stranger acting like they are someone your child should know because they are able to call him or her by their name. 4. What’s the weather like? Are you going to be out in the heat and humidity? Rain? Cold and snow? Pack accordingly. Layers are great as they allow for warmth when needed and can be removed if the weather warms up or you are working. I include thermals as they can be used for pajamas as well as a base layer during a cold day. Hats can provide warmth and/or sun protection. 5. Do you have shoes? You do NOT want to be barefoot in an emergency! Check out these 9 tips for keeping shoes on your feet no matter what. 6. If you packed clothes six months or a year or two years ago, do they still fit? Have you gained or lost weight? Gotten pregnant? Did your kids grow? It is best to check and rotate the clothing in your kit every six to twelve months. In my family’s kits I have stocked the kids with red shirts to help me keep track of them, and layers in the event we need to use our kits in cold weather. I usually get the clothes for their kits from thrift stores or yard sales for cheap. My kit has clothes I could wear outdoors or in. I have a pair of my favorite retired hiking boots tied to the kit. To help the clothes fit better in my kit and keep them dry, protected, and organized, I vacuum seal them with my FoodSaver vacuum sealer and label the package with what’s inside (because vacuum sealed clothes all kind of look the same). For the kids I’ll draw a picture on the package if they are too small to read. What clothes are in your kit? Do you have any suggestions for someone just starting out? In my family’s kits I’ve prepared 2-3 numbers bigger sizes matching shirts and trousers in green colors. Each of my sons gets a new pair of hiking boots and raincoat every year because they’re still growing. But last few years I forget to check if the clothes in the packages still fit. May be I should make a system to check more effectively. Thank you for the ideas!